The PPL40 Laser Wheel Alignment Gauge is simple to use, easy to calibrate, is battery operated (so No cables) and has a conversion calculator for degrees, millimetres / inches. It can take fast and accurate measurements from car, bus or truck. 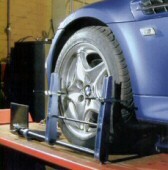 Despite being designed to cope with large commercial vehicles this wheel alignment gauge is slim enough to use on vehicle ramps & lifts as well as on the ground. The Laser, laser target plate & mirror are all situated low down for maximum visibility, ideal for vehicles with low ground clearance or large overhangs. This high precision wheel alignment instrument, designed for durability and accuracy can measure the combined toe angle on almost any vehicle. It is an essential tool for tyre fitting bays, auto workshops, vehicle preparation areas (including race & rally pits), technical schools and training establishments. 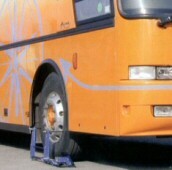 Front wheel scales are easily legible from low and high angles. Clear laser lines ensure fast and accurate readings. The Trak-Rite XY fits all wheel sizes from 10” to 20”. 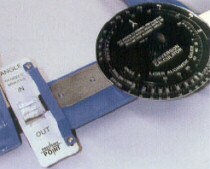 The Trak-Rite XY Max accommodates larger sizes. Low working height makes easy work of low spoilers, lowered suspension and wheel arches. Sprung aluminium contact pins, gentle on alloy wheels and simple to adjust. Easy levelling with precision bubbles. Gravity force attaches each gauge to the wheel, allowing fast workflow without loss of accuracy. Wireless operation. Two charger/rechargeable AA battery sets for minimum down time. 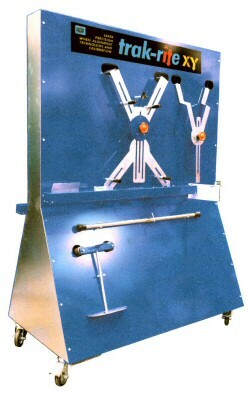 The Trak-Rite XY is a complete wheel calibration system supplied with full instructions and its own steel workshop stand to ensure that the components and accessories are readily to hand. Two versions of the Trak-Rite XY stand are available: Double-sided, free-standing, epoxy coated steel on four removable castors. Two single-sided stands, epoxy coated steel, for wall mounting. 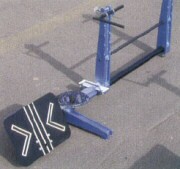 Optional equipment includes a digital caster/camber gauge.